How you update your subscription depends on which platform you're using and how you subscribed. If you subscribed directly through YNAB, changes to your subscription can be made in My Account in the web app. If you subscribed through iTunes (on an iPhone or iPad), you'll need to manage your subscription through Apple. 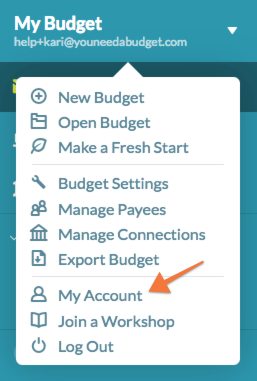 If you're using the YNAB Android app, you can make any changes (except deleting your account) by tapping the gear icon ⚙️ and then Account Settings. Did your card expire since last year? Did your bank make you change cards three times since then? No problem! In My Account, click the Update Billing Info button. Now enter your new credit card information. We'll verify the card, but don't worry—you won't be charged until your current subscription period is up! 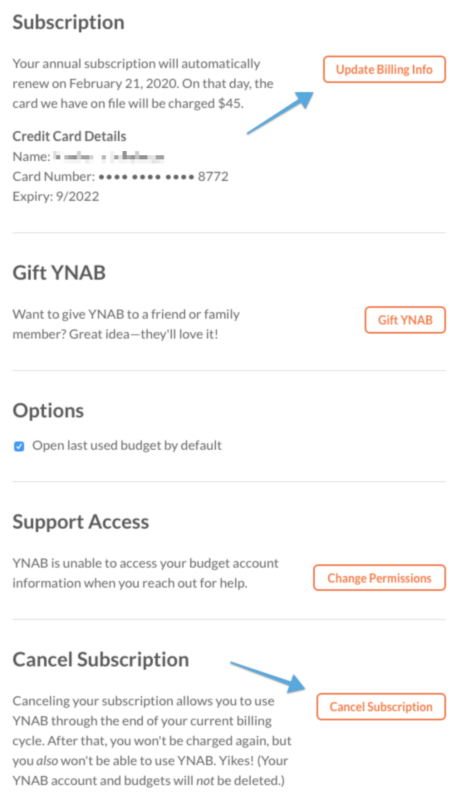 Cancelling your subscription will allow you to access YNAB through the end of your current subscription period. Until that point, you'll see an option to resume the subscription. Once it expires, your account will not renew and you will lose access to your budget. However, you can resubscribe to restore access to your budget(s). If your subscription remains expired for three years, your account data will be deleted—but we'll remind you before then in case you want to give YNAB another try!